Before starting classes, I decided I will go explore around Singapore and go shopping around ..
Parco totally reminds me of the tokyo malls and I will be heading to Japan in December! All the planning for a foodie family and friend! yikes .. So this restaurant prides itself in its crab broth ramen .. I love ramen, I love crab.. so OK lets give it a shot and see if combined will be like a double bonus combo! The broth was interesting. It had an overpowering seafood taste, stronger on the crab and it came quite light over all.. not like the normal char siew pork heavy broths. Maybe I would return .. I am not sure if it made a strong impression on me that I would actually crave it. The noodles were like those used in the ‘chinese style ramen’ in Japan .. But portioning wise is just nice for me. Not too much and heavy. 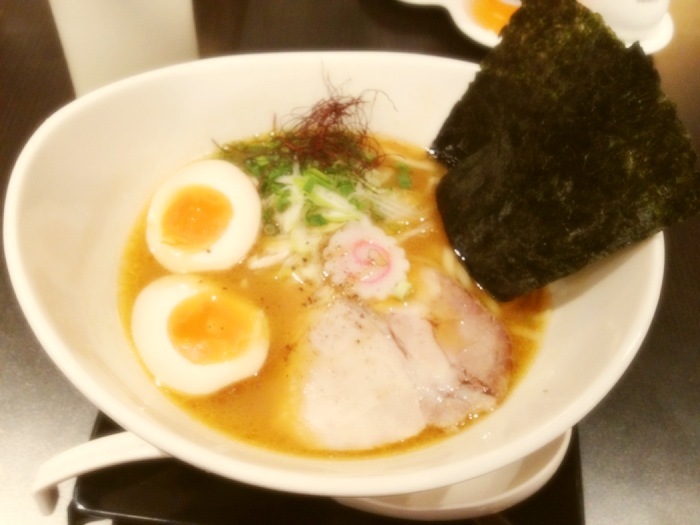 Posted on 23/11/2011 by ahballing	• This entry was posted in #Maybe, Japanese, Ramen and tagged @Singapore, Keisuke Tokyo, Parco Marina Bay, Ramen. Bookmark the permalink.